"They came from the cold and hostile North. They pillaged the monasteries putting villages to fire and the sword and profaned the churches. From the 8th century all English places of worship resounded with a new prayer: 'Deliver us O Lord from the fury of the Norseman!' In vain. . . " so it has been recorded by our establishment historians through the years. However spectacular archaeological discoveries and historical research tells us what the Viking Age was really like. And its revelations give us a somewhat different scenario from that which has previously been accepted and reveals the little known Biblical origin of the Northern European people out of whom at a later date came the Vikings. 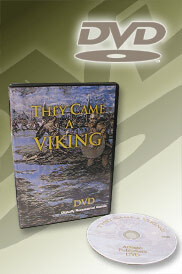 This video is not only a wonderful educational tool but is an exciting experience as you relive in color the valiant and vigorous days of the Vikings!